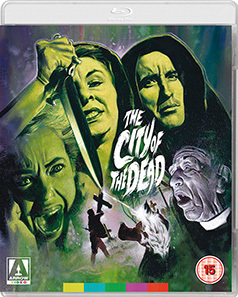 Director John Moxey's first feature, the 1960 CITY OF THE DEAD, is one of the most visually striking and atmospheric British horror films of the 60s and beyond. Slarek revisits a personal favourite and salutes the transfer and comprehensive extras on Arrow's dual format release. One thing that older horror movies have over their modern equivalent is that they had better voices. From the classic monster movies of Universal Studios through to the golden days of Hammer, horror films featured stars who had made their names in the genre and sometimes remained forever associated with it. 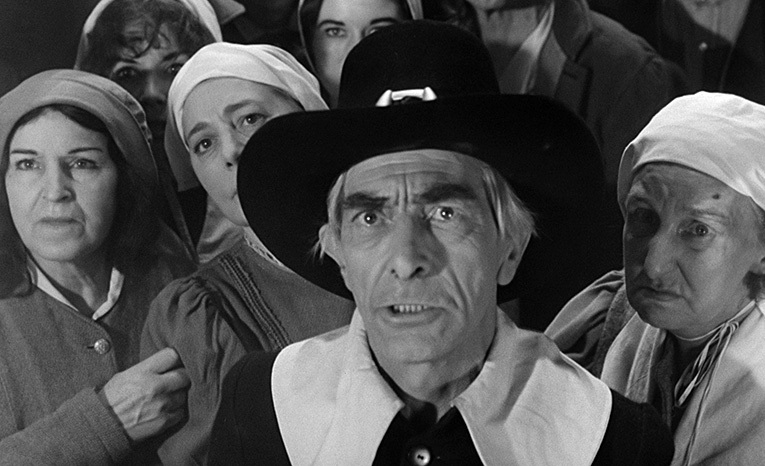 And they all had terrific, instantly recognisable voices, from Bela Lugosi's Hungarian lilt and Boris Karloff's soft English purr to the mischievous twang of Vincent Price and authoritative basso of Christopher Lee. Lee in particular had a commanding screen presence. His first appearance as the Count in Terence Fisher's 1958 Dracula remains one of the best of all screen entrances, and he's an actor I instantly accepted as Mycroft Holmes*, a man reputed to be even smarter than his famed brother Sherlock. He's someone I'd have love to have met and conversed with for a few hours, which despite our political differences, I have little doubt would have been an enthralling and enlightening experience. Lee could talk about anything and make it sound interesting. His own life and work is a story in itself – check out his fascinating autobiography Tall, Dark and Gruesome if you're looking for confirmation. But a quintessential element of Lee's voice was always its Englishness, a trait not affected in the least by his ability to speak eight languages – five of them fluently – and his early casting in the odd ethnic role. Yet in John Moxey's 1960 City of the Dead he plays an American professor. Why, you might ask, when you have such a magnificent voice at your disposal, you would saddle its owner with an American accent instead of just casting an American actor? It turns out there are a couple of commercially driven reasons. The first is that while the story is set in America and thus requires American characters, the film was made by a British film company at Shepperton Studios in London. And then there's a budget of allegedly just £45,000, hardly enough to allow for the import of even a small-scale American star, and after The Curse of Frankenstein and particularly Dracula, Lee and his close friend and co-star in these films, Peter Cushing (another marvellous voice, of course), were the nearest thing the UK horror industry had to bankable names. But Lee was also a terrific actor, and no director worth their salt would pass up an opportunity to work with him if the role suited, whatever the nationality of the character. The story kicks off in 1692 in the then city of Whitewood, Massachusetts, whose pious citizens are preparing to burn a woman named Elizabeth Selwyn for witchcraft. On her way to the stake she appeals to one of the gathered onlookers, Jethrow Keane (Valentine Dyall, yet another splendid voice), for help, and suspicion momentarily also falls on him. Has he been consorting with a witch? He denies it and his word is apparently good enough for this mob, so the execution proceeds as planned. But as the pyre is ignited, Keane begins muttering appeals to Lucifer to save Selwyn from the flames, and before she is consumed by fire, she makes her own pact with the Devil and angrily curses the city and its inhabitants. 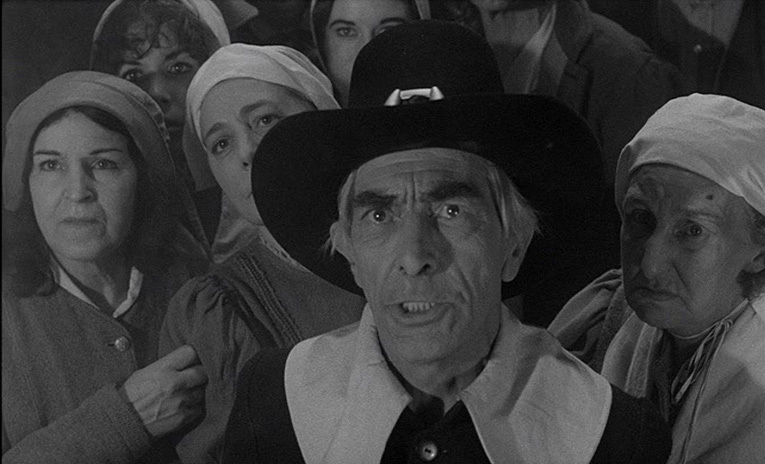 The film then leaps forward to modern times where this moment in history is being passionately recounted by professor Alan Driscoll (Christopher Lee) to his students as part of a course on the history of witchcraft. One of them, Nan Barlow (Venetia Stevenson), is keen to research her paper in more detail and asks Driscoll for a good place to start. He suggests that she pays a visit to Whitewood, which is now a small, out-of-the-way village, and despite the protestations of her scientifically minded brother Richard (Dennis Lotis) and her cynical boyfriend Bill (Tom Naylor), off to Whitewood she heads. Everything about Nan's approach to the village, which appears to exist in a state of everlasting night, is unsettling. The area is shrouded in a thick white mist, a gas station proprietor she asks for directions is surprised that anyone would want to go to Whitewood at all, and a stranger she picks up on the way (who by this point should be familiar to the audience) mysteriously vanishes from her car on their arrival. Whitewood itself offers little comfort for the inquisitive traveller. There's Mrs. Newless (Patricia Jessel), the frosty proprietor of the Raven's Inn, who initially claims that there are no free rooms but on the mention of Professor Driscoll's name suddenly discovers a single vacancy. And there's Lottie (Ann Beach), the constantly terrified and mute chambermaid, who is scolded by Mrs. Newless when she secretly tries to pass a message to Nan. What might this girl know or be trying to say? There's the sightless local priest, the Reverend Russell (Norman Macowan), who barricades Nan's entrance to the church and urges her to leave immediately before retreating into the blackness within. And then there are the locals, a creepy collection of odd-looking individuals who drift through the mist and stop to stare ominously and silently at Nan as she passes. An ideal holiday destination this clearly is not. The only friendly face she encounters is that of the Reverend's granddaughter Patricia, the recently arrived proprietor of a shop selling antiques and old books, one that I can't imagine has ever had a single customer until Nan wanders in. Even she can't afford to buy the book she wants, a weighty tome on witchcraft that she ends up borrowing and becomes so caught up in that she fails to spot the warnings it offers regarding her own potential fate. Now listen. If you've never seen this film and are planning to do so and don't want to know how the plot unfolds in advance, then I'd seriously suggest you bypass the next paragraph completely, as the discussion within is for those who are already familiar with the film and its story plays out. I'll make it easy for you – just click here and the page will scroll down past the text in question. Are we alone now? Good. Those of you who know the film will be aware that about halfway through it throws a curve ball by unexpectedly killing off what we have led to believe is its lead character, as she is sacrificed by the Whitewood coven as part of a ritual that continues to grant them everlasting life. 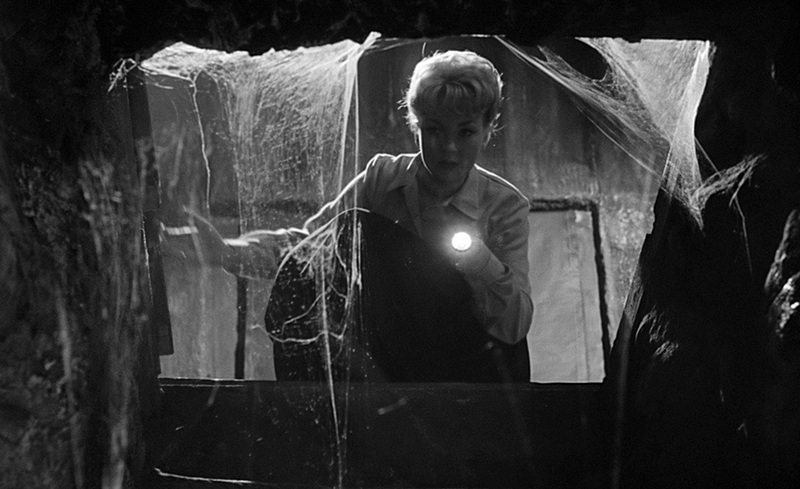 The similarity to the same but more widely celebrated carpet-pull executed by Alfred Hitchcock in Psycho has been widely remarked on, but the parallels don't end there. Blonde-haired Nan travels from home to an out-of-the-way spot to stay at a dodgy hotel and is killed by the establishment's proprietor. The disappearance is investigated by two men and a woman, a pairing comprised of a sibling and a boyfriend, who are falsely informed by her killer that Nan departed the day after she arrived. Two of them even approach a figure at the end and get a shock and a screaming close-up when it's face is revealed. Wow, those co-incidences are piling up, aren't they? The obvious supposition is that there is some serious borrowing going on here and that the film is trading on the success of Hitchcock's masterpiece. There's just one thing – the two films were shot almost simultaneously in different countries with little knowledge of the other's existence, let alone content. Uncanny, huh? OK, we're back on safe ground. No more serious spoilers, I promise. 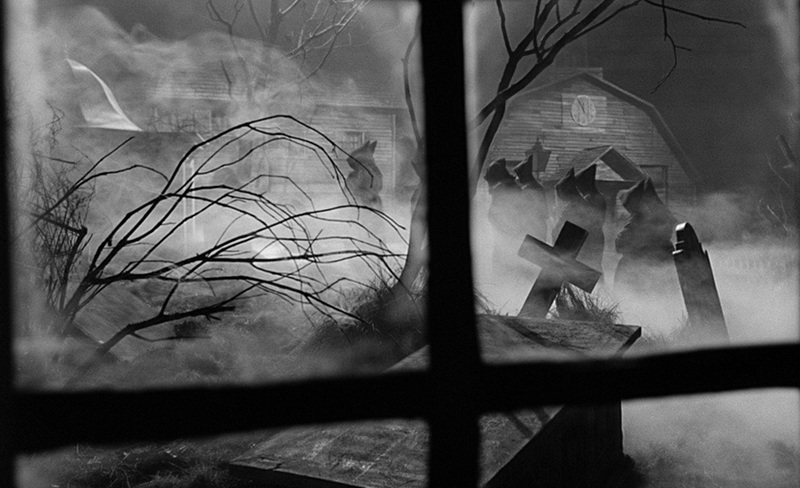 The story provides the framework, but City of the Dead's well-deserved status as a cult horror favourite lies primarily in its execution, notably John Blezard's creepily suggestive art direction and Desmond Dickinson's extraordinary monochrome cinematography. Between them they make it feel almost as if Nan has stepped out of the real world and into one crafted from her own nightmares, as figures stand motionless in thick white mist or are creepily silhouetted as they shuffle into the graveyard for a midnight mass. Even the flickering of firelight as Nan first enters the Raven's Inn has strangely demonic overtones, while her descent into the blackness of a cellar located directly below her room, guided only by a narrow beam of light from her torch, is as tense as any such scene you'll find in more recent horror cinema. 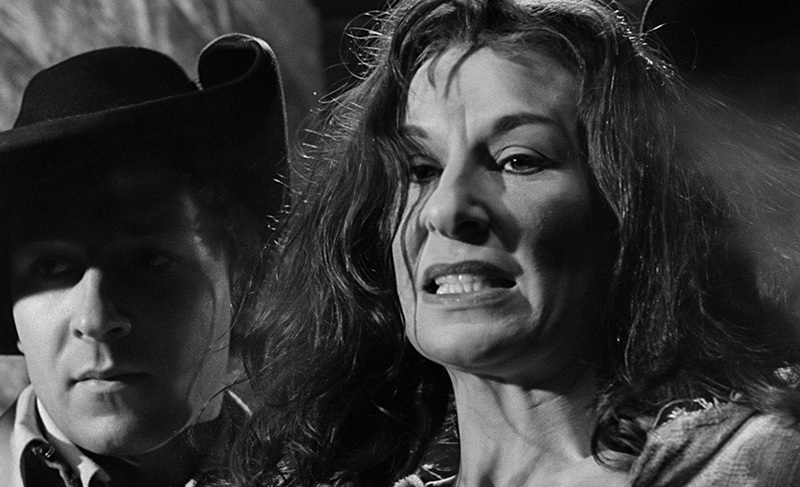 The imagery and atmosphere don't just belie the film's budget, they make a mockery of it – rarely if ever will you have you encountered a horror film that looks or feels quite like this one. 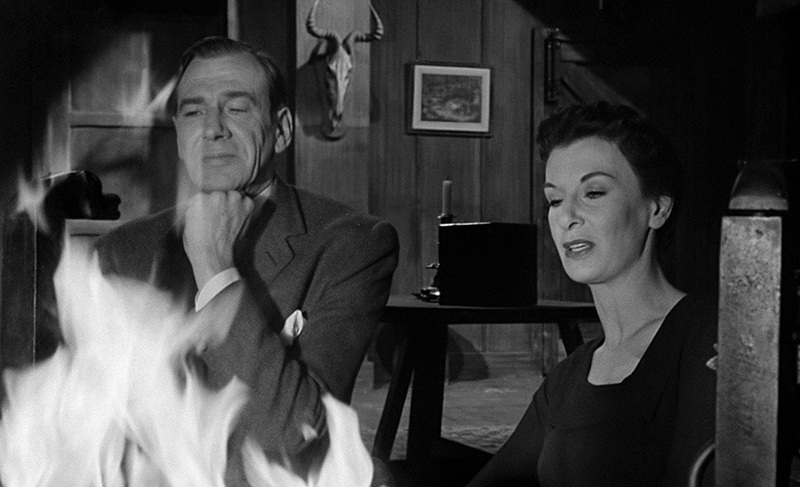 But if Dickinson and Blezard give the film its distinctive visual style, then all credit to first-time feature director John Moxey for knowing just what to do with it. 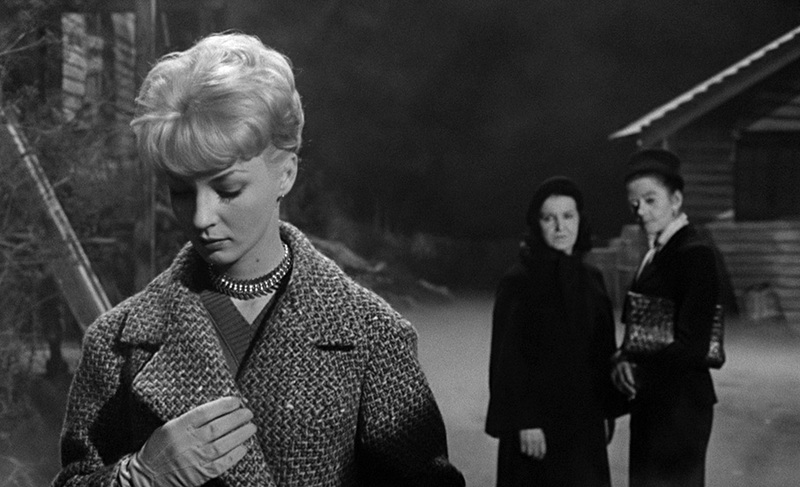 His camera placement repeatedly intensifies Whitewood's creepiness, from his arrangement of multiple characters in frame to his thoughtful and effective use of personal viewpoints (Nan's arrival in town is made all the spookier by a motionless figure that is distantly illuminated by the car's headlights), while his inventive use of editing delivers a John Carpenteresque frisson when an eerie late night dance (which itself has shades of Herk Harvey's yet-to-be-made Carnival of Souls) comes to the sort of abrupt ending that only film can deliver. The cut-with-a-knife atmosphere is nicely counterbalanced by performances that have conviction but are also, for the most part, effectively underplayed, no mean feat for a partly English cast having to work with (mostly convincing) American accents. Venetia Stevenson (whose accent is real) in particular makes for a likeable and believable Nan, while Lee quietly shines as the professor who may be more than he first seems, and Patricia Jessel walks a fine line as the sinister Mrs. Newless, nicely sidestepping the sort of melodramatic interpretation that such a role almost invites. Only Tom Naylor as boyfriend Bill Maitland seems to struggle a little in the early stages, but he makes amends and how in the strikingly visualised Whitewood graveyard climax. The first production by independent production company Vulcan, who after three films were transformed into Hammer's only real rival Amicus, City of the Dead is a terrific example of the sort of restrained, imaginative and smartly executed British horror film (Sidney Hayers' 1962 Night of the Eagle was another) that should by rights have led the way forward for the genre. But the ball was somehow dropped and picked up by the likes of Roman Polanski and George Romero, whose 1968 Rosemary's Baby and Night of the Living Dead marked the end of the long-standing British dominance of the genre and the beginning of a new wave that would put American horror cinema back on top. Back in 2007, when I reviewed the American VCI DVD release of the film, I was impressed with the transfer on that disc, and revisiting it in the course of writing this review I was surprised to discover that it still stands up. Having said that, the DVD transfer in this new Arrow dual format release, which was sourced from a new 4K restoration by the Cohen Collection and the BFI, is still clearly visible step up, something first evident in the opening titles, which display some movement in frame on the VCI disc but are absolutely rock solid on the Arrow DVD. The image is also noticeably brighter on the Arrow disc, which gives rise to better shadow detail in the darkest areas without compromising the black levels or burning out the highlights. The occasional dust and dirt spots on the VCI transfer have been completely removed here, though I did note that while both discs are framed 1.66:1 and anamorphically enhanced, the Arrow transfer appears to slightly less picture information at the edges than the one on the VCI disc. The sharpness and detail are equally strong on both the VCI and Arrow DVDs, but both are visibly outshone on this score by the Blu-ray in Arrow's dual format set, which display a beautifully crisp level of detail and a richness to the greyscale that gives the HD image a serious edge. Never have I seen the film looking as good as it does here, and even when the mist is at its most dense, there are no compression artefacts to contend with. in brightness and the extra information at the edge of frame on the VCI disc. The mono soundtracks on Arrow's dual format release – Dolby Digital 2.0 on the DVD, Linear PCM 1.0 on the Blu-ray – are more robust than the mono track on the VCI DVD. The clarity and expected range restrictions are similar, but the faint background crackle on the VCI disc is almost completely absent here and the sound level is higher on the Arrow discs, though there is a treble bias that does render words with the letter ‘s' in them as a little hissy in places. In America, City of the Dead was cut by approximately 2 minutes and released as Horror Hotel, which has been included here in its entirety. On his commentary track, Jonathan Rigby speculates that the title change was made in an attempt to cash in on the similarities to Psycho (if you haven't seen City of the Dead then you'll need to read the paragraph above that I tried to steer you around to appreciate these connections), but I've yet to read a rationalisation for the cuts – there may well be one in the booklet that accompanies the first pressing of this release, but I've not seen that yet. The missing segments all appear to consist of lines of dialogue, the most prominent occurring in the opening sequence, when Selwyn's cursing of the town and its people is all but gone. The lively Moxey revisits some of the ground covered in his commentary below, but there's enough new stuff here to keep this interesting, especially the details of his early career and his subsequent work in America. As with many of the extras here, this was sourced from the VCI DVD. Lee is interviewed by fan-faced genre critic Brad Stevens, who also supplies the noddies to disguise the edits. With his work on City of the Dead covered in his commentary track, Lee here looks back at his career and the directors and actors he's worked with, and gets seriously miffed at his continued typecasting by the media and particularly the British tabloid press. There's a little bit of rambling and repetition at the end, but Lee was always one of the most interesting raconteurs in the business, so I'm not complaining. One particular note of interest is that the interview was conducted shortly after the completion of Lord of the Rings but before its release – Lee predicts that it's going to be huge. Surprisingly, this wasn't on the VCI disc, despite being shot by someone involved in that release, presumably more as a personal record of the event rather than for a specific disc extra, which would explain the sometimes migraine-inducing shakes and wobbles of the camerawork. Basically, it's a single-shot record of a seated Lee chatting with some of those responsible for the production of the VCI disc (who stand around smiling in appropriately fanboy fashion), signing and posing for photos and responding to questions and comments. His hostility to the British tabloid press and complaints about what he calls "the politics of envy" is in full flow here, with the Daily Express the target of specific venom. The actress recalls her role as Nan Barlow and suggests that the principal thing she brought to the part was an American accent. She covers her career, including her abandonment of acting to become a mother and later a production manager – the work she is most proud of is Walter Hill's Southern Comfort. Visually in good shape, sonically less impressive, and littered with serious spoilers. A collection of 34 promotional stills and posters, all high quality. Exclusive to this new Arrow dual format release, this commentary by Jonathan Rigby, author of English Gothic: A Century of Horror Cinema and Christopher Lee: An Authorised Screen History, is a real mine of information on the film and those involved in its making. He supplies detailed biographies for all the lead actors and even a couple of the supporting players, as well as director John Moxey (including the specifics of why he added 'Llewellyn' to his later film credits), cinematographer Desmond Dickinson and producers and Amicus founders Max Rosenberg and Milton Subotsky. He also outlines what happened to the film after its completion, complete with quotes from a number of contemporary reviews. I winced a little when he nailed some of the very same links to Psycho that I've detailed above, though I will say in my defence that I first made those points back in 2007 – as Rigby makes clear here, however, reviewers were making that connection back on the film's original release. Another extra sourced from the VCI DVD, though my excitement at the prospect of a Christopher Lee commentary was tempered a little by a couple of small but significant misjudgements on the part of those tasked with supervising its recording. The first is the decision to sit Mr. Lee in front of a film he hasn't seen for over 40 years and then shut off the soundtrack, meaning that we get to hear Lee repeatedly wondering what is being said by the characters and reacting with bemusement to actions that would be clear if he could hear the dialogue. A little annoyingly, the very soundtrack that Lee was unable to hear has then been reinstated for our benefit, and is occasionally loud enough to compete with Lee for our attention. But in other respects this is an enjoyable and very worthwhile inclusion. Lee spends a little too much time describing what we're watching, but moderator Jay Slater regularly interrupts with questions that give rise to some fine stories and consistently interesting background detail on the filming. Anecdotes abound and are not consigned to this film, his work with the likes of Tim Burton, George C. Scott and even George Lucas also getting a little coverage. There are some engagingly humorous moments, not least when the subject of Star Wars comes up and Slater specifies Attack of the Clones. "Yes, well..." Lee begins in response to a title he was not impressed with, "...you'll have to speak to George about that." He also discusses the nature of good and evil in the modern world, and suggests, contrary to popular opinion (but agreeing with Camus in his review of Casino Royale), that Timothy Dalton was the actor best qualified to play James Bond. "Ian Fleming was my cousin," he reminds us, "so I know what Bond was supposed to be." Also sourced from the VCI DVD, this commentary by director John Moxey does have a few substantial pauses early on, but it gets busier as it progresses and proves an involving and informative listen. There's plenty of information on the actors and a fair amount on the technical details, notably Dickenson's lighting and photography – "Every first time director should be lucky enough to have such a great cinematographer work for him," he remarks. He fills us in on some of the work he's done since, and offers an opinion on some subsequent genre films, some of which he admires – Night of the Living Dead, The Exorcist, Jaws, Rosemary's Baby, The Silence of the Lambs – but others he's less happy with – The Shining, Child's Play, The Blair Witch Project, Friday the 13th and just about anything that just throws gore at the screen. Also included in the first pressing is an Illustrated Collector's Booklet featuring new writing by Vic Pratt, but this was not supplied for review. 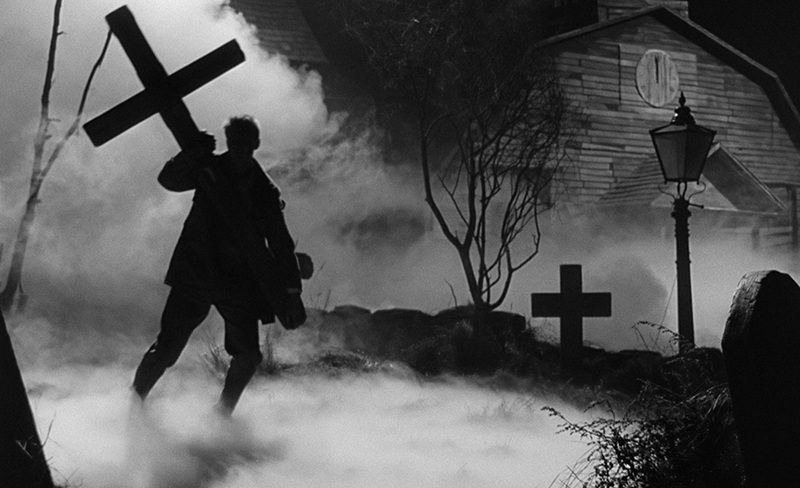 Despite its faux American setting, City of the Dead remains one of the most visually striking and richly atmospheric examples of British gothic horror at its finest, one whose creepy build-up, mid-film twist and glorious finale have stood the test of time handsomely. This is the release I've personally been waiting for, one that brings together all of the special features from the previous VCI DVD, adds an excellent commentary track of its own, and boasts the sort of HD transfer that Desmond Dickinson's gorgeous monochrome cinematography has been crying out for. Highly recommended. * In Billy Wilder's The Private Life of Sherlock Holmes (1970) – to this day, Lee is the only actor to have played both Sherlock and Mycroft Holmes on screen.